Two words best describe Hawke’s Bay and they are Wine Country. As locals and visitors alike know, there is much more than wine to this sunny region – Hawke’s Bay attractions are plentiful and varied. Hawke’s Bay has a wide range of great things to do and wonderful places to see. Be sure to leave yourself enough time to cover everything. We’d love to host you during your stay – don’t forget to check out our rooms and facilities or book online today. Hawkes Bay attractions and activities are wide-ranging. From country parks, lovingly restored wetlands and estuaries to the great cycle and walking tracks. The diverse landscape provides areas for water sports, horse-riding, biking, hunting and fishing. Golf – Cape Kidnappers Golf Course one of the great modern marvels in golf. Water Sports – Treat the kids to Splash Planet, a water-based theme park in Hastings. Riding – Linking multiple Hawkes Bay attractions the bike trails link up plenty of attractions from the pools at Ocean Spa to the National Aquarium. Fishing – Hawke’s Bay’s has some of the best fishing spots in the country. Hawke’s Bay Beach Fun – great beaches for swimming, surfing and fishing. The Art Deco architecture of Napier deserves special attention and has been kept impeccably maintained to this day. Hawke’s Bay has a vibrant and flourishing art scene including world-class galleries to artists’ studios, collectives and contemporary design stores. The Art Deco architecture of Napier deserves special attention and has been kept impeccably maintained to this day. Te Mata Peak – rising 399 metres above sea level, Te Mata Peak gives visitors a stunning 360° view of Hawke’s Bay. 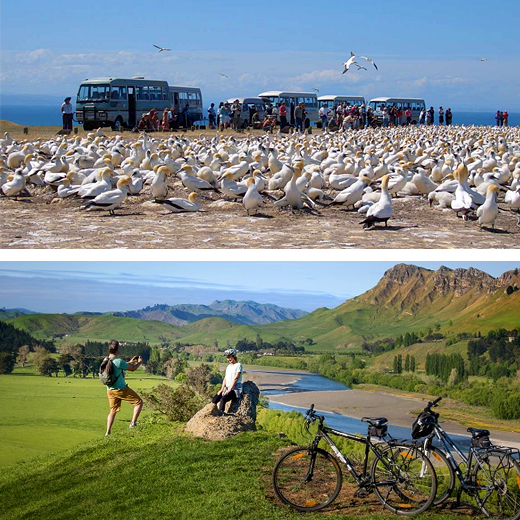 Explore the world’s largest mainland gannet colony on Cape Kidnappers – visit gannets.com or gannetsafaris.co.nz – another iconic Hawkes Bay attraction. Get up early and watch the sunrise from Marine Parade. Swim with the Sharks at the National Aquarium, an iconic Hawkes Bay attraction. Hawke’s Bay is a great destination for family-friendly holidays, and no matter where you go there is always plenty of things for kids to do. Museums, day trips, activities and natural landscapes are all here to be enjoyed. Arataki Honey Visitor Centre – New Zealand’s largest beekeeping enterprise. the Visitor Centre is an experience that people of all ages are sure to enjoy. Par2 MiniGolf – in the heart of Napier’s tourist zone, alongside the Napier i-SITE Visitor Centre. Splash Planet – entertain the kids in summer with a trip to this water-based theme park set in 6.5 hectare of parkland in Hastings. 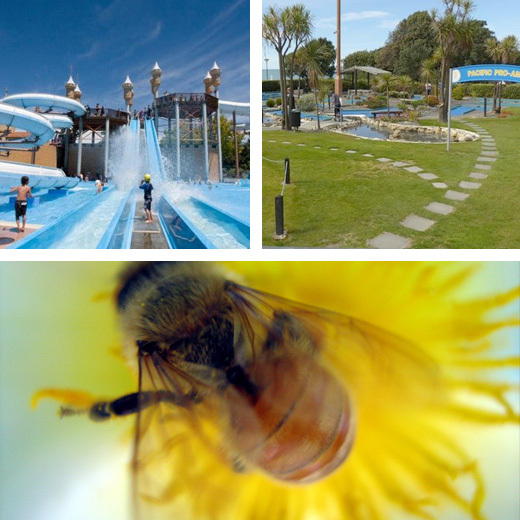 A hugely popular Hawkes Bay attraction for locals and family visitors. Hawke’s Bay is regarded by many as the “food bowl” of New Zealand. The best place to start is at the weekly Hawke’s Bay Farmers Market. This has become an iconic Hawkes Bay attraction which brings together numerous artisan sellers every Sunday. 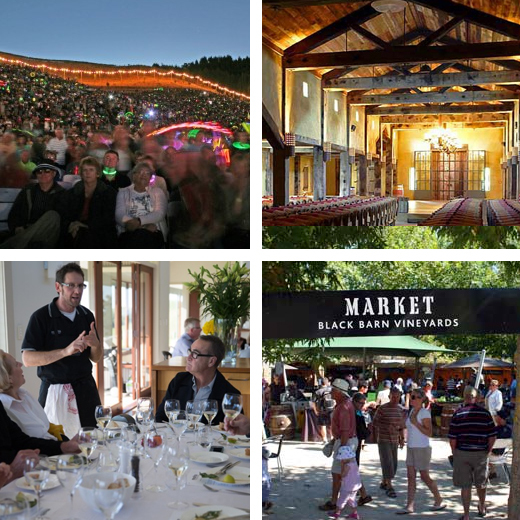 With over 100 vineyards and 80 wineries, visitors to Hawke’s Bay are spoilt for choice when it comes to wine.The annual Mission Estate concert is a must see event. 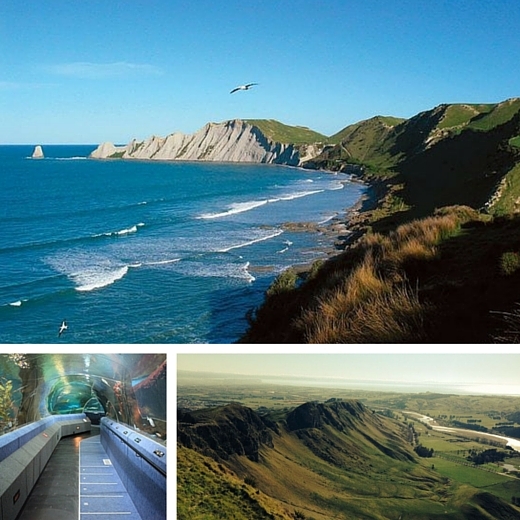 There is a wide range of tour options available for the visitor to explore the many Hawkes Bay attractions. Takaro Trails offers self-guided cycle tours in Hawke’s Bay ranging from one day tours up to five days with accommodation and bag moving included. Cape Kidnappers – Tour options include overland and helicopter safaris and tractor rides along the beach. Visitors can get within a few feet of the world’s largest, most accessible mainland gannet colony which is at the top of the Cape’s sheer and barren cliffs – visit gannets.com or gannetsafaris.co.nz for more information. See more tours on the Hawke’s Bay NZ site.